This post has been sponsored by Dr Pepper® and Johnsonville®. All thoughts and opinions are my own. Cowboy Queso – A chunky queso dip with chopped green chiles, roasted tomatoes, ground sausage, and sliced smoked cheddar sausage. The best dip to feed a hungry crowd during a tailgate. Perfectly pairs with ice-cold Dr Pepper! Football season is in full swing, people! If you’re like me, you’ve been spending your weekends hooked to the TV, watching your favorite team. In the South, our fall weekends revolve around football. If someone plans a wedding on a key football weekend, you’ll find a group of people huddled in a corner watching the game on someone’s phone. It’s THAT serious. To no one’s surprise, I love making food for homegating get-togethers. I put a lot of thought into what I want to serve for these parties. It has to be something unique but also recognizable. But above all, it has to be filling. That means, almost all my favorite tailgating foods have tons of hearty flavors. And this Cowboy Queso is no exception. This Cowboy Queso has all the fix’ns made for a “cowboy”: chunky tomatoes and chiles, hearty servings of crumbled sausage, sliced cheddar sausage pieces, and smoky spices. I don’t have to tell you how incredibly flavorful this queso is. Look at all those chunks! After the first bite, I was in queso heaven. I’m no cowboy and this queso still makes me drool just thinking about it. With any salty snack, you need something sweet to quench that thirst. Dr Pepper has always been my drink of choice because it’s got just a hint of sweetness that I crave to balance out my snacks. You know I love my sweet and salty combo. To make this queso, it’s actually quite simple. But before we get into it, I need to say this – there is absolutely NO fake cheese here. I am not a fake-cheese hater, don’t get me wrong. But there is a time and a place. And this cowboy queso is neither. I love the big flavor and textures of real cheese so that is what I wanted to use in this queso – especially if I want it to stand up to the bold spices and chunks of sausage. Speaking of the sausage, I used a combination of two Johnsonville sausages to achieve the perfect flavor in this cheese. Johnsonville sausages have the best seasonings so I never had to add anything to them when I’m using them in a recipe. And what’s even better is that I don’t have to visit a specialty store to find these good-quality sausages – I easily found them at my local Publix in the breakfast meat section and/or the freezer aisle. First, I sliced 3 Johnsonville Beddar with Cheddar Smoked Sausages and cooked them in a skillet just to crisp them up a bit. I love the extra bite they have after then get grilled or sautéed. Plus, how much more perfect of a sausage can you get?! It has cheese IN the sausage! Then, I crumbled two Johnsonville Original Brats into a skillet and browned them up. Their Original brats are such a classic sausage flavor but not overly spicy. We have so much spice going on in the queso with the diced chiles and pepperjack cheese so these sausages are the perfect fit. After you’re done making the queso, you’ll have some extra sausages leftover so you can grill them up and eat them for dinner that night! I use cheese that I shred myself. Pre-shredded cheese has additives that makes the cheese not cake together. These additives make it hard for the cheese to melt together into one cohesive piece. In the pictures, I show the queso served in a cast-iron skillet. I love using my skillet for serving. It has a rustic look, keeps the dip warm, and is perfect for scooping out dip. However, I don’t like using a metal whisk against my cast-iron, for fear that the whisk will chip off the coating. So I make the dip in a saucepan and then pour into a warm skillet. To make a queso with real cheese, you need to slowly melt the cheese into the milk base. Otherwise, the cheese will clump up and never get smooth. Don’t worry though – my recipe below will walk you through the right steps to make sure this doesn’t happen. There you have it – the queso of your sausage and cheese dreams. Don’t forget to serve this salty dip with a sweet drink that all the football fans crave – Dr Pepper! Become the Party QB and win tickets to the SEC Football Championship on December 2, 2017 in Atlanta, GA! Three Grand Prize Winners will win 2 tickets to the game, airfare, and hotel accommodations, thanks to Dr Pepper® and Johnsonville Sausage®. 50 other lucky winners will win a $50 Publix Gift Card! Don’t let your team down! Visit TailgateToVictory.com for your chance to win. Enter between 9/11 – 10/13/2017. Dr Pepper and Johnsonville are proud sponsors of the SEC. A chunky queso dip with chopped green chiles, roasted tomatoes, ground sausage, and sliced smoked cheddar sausage. 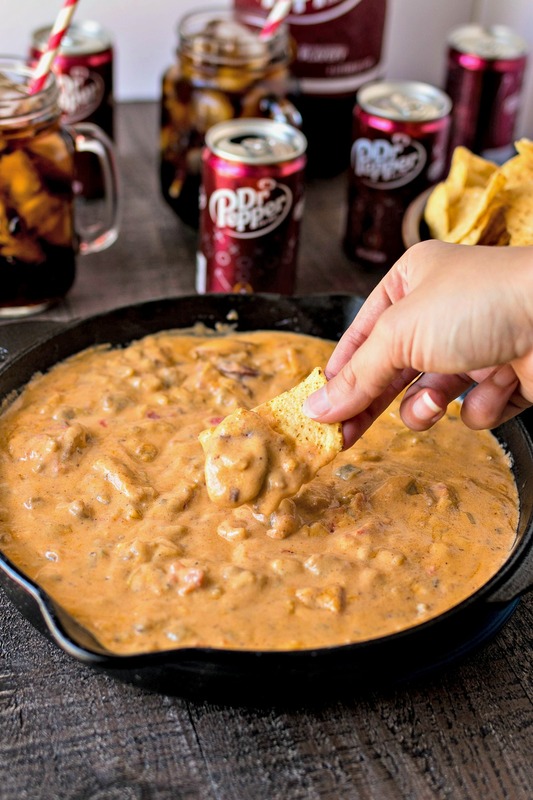 The best dip to feed a hungry crowd during a tailgate. Perfectly pairs with ice-cold Dr Pepper! First, we'll crisp the Beddar with Cheddar sausage. Heat medium skillet on medium heat. Add a little nonstick spray. Add sliced Beddar with Cheddar sausage to pan and cook until the bottom gets brown and crispy, about 4 minutes. Flip and cook the other side for another 3 minutes. Remove and set aside. Place skillet back on heat. Add brat sausage meat (removed from casings) and break it up with a wooden spoon. Cook until the sausage is browned, about 5-7 minutes. Drain and set aside. Place a large saucepan over medium-low heat. Add butter and let it melt completely. Once melted, add flour and whisk together to make a roux. Once flour and butter have combined, let it cook until it starts to turn golden brown, about 5 minutes. Slowly whisk in the half and half. Let the milk mixture heat up until bubbles start to form around the edge. Reduce heat to low. Add about 1/4 cup of the shredded cheese to the mixture and whisky continuously until it completely melts. Repeat with rest of cheese in 1/4-cup increments. Do NOT add more than 1/4 cup of cheese at a time. Otherwise, the cheese will clump up and remain lumpy. Once the cheese is completely smooth and melted, add diced chiles, tomatoes, spices, and garlic. Whisk together. Then, add in the sliced cheddar sausage and crumbled brat sausage. Stir together with a wooden spoon. Raise heat back to medium to get the cheese nice and hot. Continue stirring until cheese is hot. Give cheese a taste. Add salt and pepper, if necessary. Place cheese into a large skillet or other serving dish. Serve with a bowl of tortilla chips and ice-cold Dr Pepper! This is a must have to try!! So yummy!! Yum, yum! This scrumptious Cowboy Queso is now on my list of recipes to make this weekend when the family gets together to celebrate a birthday. And it’s absolutely perfect for the fall season. I need to run, not walk, to my local market to pick up a yummy package of Johnsonville Smoked Sausages. And Dr. Pepper – it’s a party favorite! I love regular queso! I definitely need to try this!! Yes you’re gonna love it! I so agree that the food for game parties needs to be filling!…otherwise I’d fill up on the desserts‍♀️ This dip sounds like something we would love at our house! Haha same here! I hope you guys get the chance to try it out soon! This sounds so yummy! I’ll totally have to make this because I’m a queso addict. You and me both! I could eat this for a meal! Mmmm this queso looks so tasty! Cannot wait to try to have some at home! Oh my gosh, this looks amazingly delicious! My sister makes something similar but not with sausage in it. Yum! Am I a sports fan? Eh. Am I a sports FOOD fan? HECK to the yes!!! I get so excited for every weekend in the fall just because of the game day eats. This one definitely needs to be added to the table! You got that right! I hope you have a chance to try it soon! Wow — this is sooooo going to happen next Sunday for football. Looks delicious! I haven’t used brats in my queso recipe before. Thanks for the new twist! I couldn’t pin this fast enoug This will be a perfect recipe to take to a friends house to watch the game! Yum! Thanks for sharing! Yes, for sure! Let me know how you like it! Oh my this looks so yummy. I am trying this recipe. Omg yum!! I love the bacon and sausage in there.